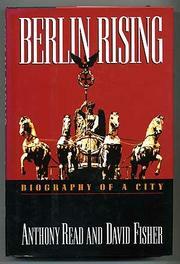  A lively, rewarding history from the well-qualified authors of The Fall of Berlin (1993). Acknowledging the ``strange fascination'' Berlin has exercised on the world for more than a century, Read and Fisher go back to its beginning and clarify what makes the city so strange. Tracing Berlin's growth from ``a malodorous garrison town'' in the Middle Ages to a political, industrial, and cultural capital in the late stages of its rigid Hohenzollern rule (1442-1918), they stress the age-old tension between the one-way direction of social change, imposed from above, and a mobile, ``mongrel'' populace. Berliners-- a useful reminder, given today's renewed German xenophobia--are ``a people largely composed of successive waves of immigrants'': Dutch and part-Slavic Silesian settlers, and such welcome refugees as Huguenots, court Jews expelled from Vienna, Jacobite Scots; later, White Russians. Brash, skeptical, ``bloody-minded'' Berliners, the authors claim, have long made their authoritarian leaders-- Friedrich Wilhelm, Bismarck, Hitler--secretly hate the city. Indeed, Berlin life is pervasively harsh: A late-19th-century female worker's life expectancy was a mere 26 years, and Princess Royal Vicky, daughter of England's Queen Victoria, came to loathe a palace that denied her baths, toilet, and running water; Goebbels himself was struck by ``the pitilessness of this town.'' In early chapters, Read and Fisher offer arresting sketches of a backwater town gripped by petty, sometimes quite demented princes, barely touched by Renaissance or Reformation. When Prussia becomes a major power and Berlin its center, however, the authors' ``biography'' gives way to more general political history easily found elsewhere, though later chapters restore local perspective on industrial growth, labor reforms, popular rebellion, and organized crime. Dowdy line drawings decorating the chapter headings underscore the final chapter's flat message of perenniality (``Berlin Is Still Berlin''), but chronologically ordered plates offer more pointed commentary to this fascinating subject.